Nordis Signs has begun installing almost 2,000 temporary road signs to direct cyclists competing in Olympic road-race events around the 250km course, and divert other road users onto alternative routes. 1,800 signs will be installed along the course, which passes through London and Surrey, in phases over the next seven weeks. 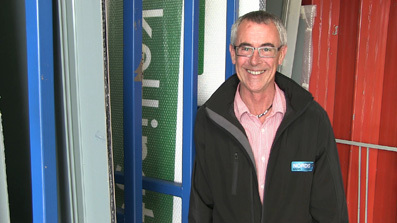 Nordis Signs has manufactured the temporary signs at its factories in Ringmer, East Sussex and Northampton. With the help of its supply chain partner J. McCann, Nordis will install and maintain the signs before and during the Games and then remove them afterwards. While many of the signs will be attached to existing roadside infrastructure, Nordis will also use more than 500 A-frames and 3,000 sandbags (to hold them in place) for temporary signage. Steve Wright (below), manager of Nordis Signs, said: “Our team has worked hard to develop the signs and we’re proud to be involved in this great sporting celebration. Some of the installation work will take place alongside busy roads including the A30 dual carriageway Egham bypass. To combat this Nordis is employing stringent safety measures including special “crash cushions” fitted to the back of trucks to protect the teams of fitters in the event of any accidental collisions. Working in partnership, Nordis Signs and May Gurney successfully managed the signage and traffic management for the Surrey Olympic Cycle Classic test event last year. May Gurney is also working with Surrey County Council to maintain the county’s roads, and has carried out thousands of square metres of resurfacing ahead of the Games, and will conduct traffic management and enforce road closures for the duration.